When the Delta was first explored by white men, it was a huge marsh cut by snag filled and tide influenced waterways. The low lands were covered with tules and willows. The valley oak was dominant, but there were also huge sycamore, laurel, willow, elderberry, locust and cottonwood trees covering the land. Large flocks of pelicans, ducks, geese and cranes were common in the lagoons and tule swamps. The rivers were filed with an endless supply of fish and beaver. Muskrat and otter were also bountiful. Local Indians, in a primitive fashion, farmed the rich soil. They used the tule reeds to construct boats, homes and baskets. The Indians lived a good life, and Mother Nature supplied them with an abundance of fish and game. During the winter months they moved into the foothills away from the waterfront. By 1850, during the gold rush days, paddlewheel steamers ran between San Francisco and Sacramento, as well as Stockton. Many of those ships were wood-burners using river oak and pine cut in four-foot lengths and collected at the river’s edge. Some consumed as much as a cord of wood per hour. Long before the railroads arrived or there were adequate roads in this region of California, the river was used as the primary means of travel. What made the Delta was its people. It was people that reclaimed the land. They built dikes and levees, dug the channels, created river ports and landings, and defied Mother Nature herself. When the waters swelled over the banks of the rivers to reclaim what was hers, it was the people that rebuilt the levees and started all over again. Early settlers purchased large tracts of land as early as 1855 for $1 an acre throughout the Delta region. By 1878, land values had increased to $5 an acre. In 1860, Mr. Stone reclaimed the land where Bethel Island is located today. Stone acted under the Swamp and Overflow Act of 1855. The island was originally known as Stone Tract and didn’t actually become an island until the late 1890’s when Dutch Slough was dredged to the east to meet Sandmound Slough. Taylor Slough was extended south by dredging to meet Dutch Slough, and Piper Slough was extended to meet Sandmound Slough. In the early days, Stone Tract was known for the rich soil that grew cattle feed and grains and for the dairies that were established there. The land yielded hay grain that was transported to market by barge. Major William K. Bethell purchased a large tract of land (approximately 3,500 acres) from Mr. Stone. In 1871, Bethell sold part of his holdings to Mr. J. Cheney. Apparently, the name was changed from Stone Tract to Bethel Island in 1898, when the Board of Supervisors sold a strip of land forty-five feet wide for $1 to Frank and Anna Bethell for a road. Why the second “l” was left off no one knows. The first residents of Bethel Island received their mail and supplies by boat delivery. They were very isolated form the other communities of East Contra Costa County. Reclamation District 1619 was established in 1915 as part of the Swamplands District #1,102, 107, and 183. These earlier districts had been formed in 1894 to raise funding for levee maintenance. Reclamation District 1619 became the Bethel Island Municipal Improvement District in 1960. In 1916, William J. Hotchkiss acquired 1,317 acres on Bethel Island to grow potatoes, beans, and sugar beets. About the same time, Judge E. A. Bridgeford purchased property and established a cattle ranch. A single lane wooden bridge made out of two-by-twelve planks was constructed in the 1920’s. The Farrar family cleared a eucalyptus grove and established a recreation area near the bridge. This was Bethel Island’s first recreational related enterprise. 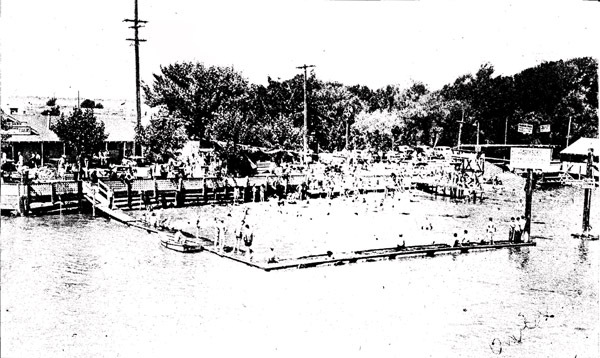 Many old timers in the area recall picnics, swimming, and Sunday afternoons at Farrar Park. By the 1940’s, hunters and fishermen had established a week-end colony near the old wooden bridge. After World War II, hunting and fishing cottages began to spring up on the periphery of the island. Sportsmen, fishermen, and boat enthusiasts had discovered the peace, quiet and solitude that Bethel Island offered and came in droves. It wasn’t until 1946 that Bethel Island got electricity. In 1948, they got telephone service. On August 16, 1946, the first Post Office was established in the rear of the E&E Café with Ethel Boxel as postmistress. Prior to the coming of postal service, residents received their mail in a row of boxes nailed to a fence near the bridge. With the arrival of these services, the population of the island increased to a point where the one –lane bridge had to be replaced. The building of the new bridge marked a turning point in Bethel Island’s history. The first post office was built, stores were constructed, and facilities were established to offer complete boat launching, fishing and other recreational activities. Modern Bethel Island has about 3,000 acres. It is assumed that before reclamation, Stone Tract was about 6,000 acres which could have included land known today as Hotchkiss Tract. Today Bethel Island is the most densely populated island in the Delta and offers complete services for permanent residents, as well as weekend visitors. The island is often referred to as “the heart of the Delta”.